Camping doesn't have to be uncomfortable with all the new Glamping options available across the country, and we at Mystic Quarry think that the Texas Hill Country is one of the best places out there to go glamping. Whether you're just passing through, or you're looking forward to an extended stay, Texas glamping is at its best at Mystic Quarry. Read on to learn more about the Texas Hill Country, Mystic Quarry's glamping options, and the best times to explore this beautiful area. Why Is the Hill Country Great for Glamping? The Hill Country is known for its calm weather, and green, rolling hills are the hallmark of this beautiful temperate region (but you'll still see a cactus here and there). Best of all, the Hill Country is close to big cities like Austin and San Antonio, which means that all of the amenities of home are at your fingertips when you visit this region. You get to experience the best of both worlds. A quiet place away from the city hustle and bustle, yet the option for fun day trips to nearby attractions. What Are the Best Times to Visit the Hill Country? In truth, the Hill Country is a great place to visit any time of year. However, things can get pretty hot in central Texas during the height of summer, and the Hill Country gets pretty chilly in the middle of the winter. Therefore, the two best times to visit this region are the spring and the fall. In the spring, you'll start noticing the light bluebonnets sprout out on the countryside, and you'll also be able to see the bicolor iris in full bloom. Rain is rare in the Hill Country in the spring, which is part of why the late spring months are the busiest for tourism in this stunning region. In the Fall, you can take advantage of a slightly lower temperature at night, so you can really cozy up by the campfire for s'more's! There's also a variety of events in the area that you can take advantage of, like Wurstfest, the Gruene Music & Wine Festival, and more. Whenever you decide to go glamping in the Texas Hill Country, Mystic Quarry is the place to be. With 20, 30, and 50-amp RV sites available, all rigs can be accommodated, and you have your pick between Standard, Deluxe, and Premium back-in and pull-through sites. For those without an RV, our tiny houses, pet-friendly cottages, and Glamping tipis can please even the most timid campers. With full kitchens, heating, A/C, and TV's we have a variety of accommodations that will fit your lodging requirements. In addition, our campsite amenities will ensure you're never bored. Take a dip in our recently renovated pool, explore our onsite nature trails and meditation spots, or check out the rec hall. We also offer live music on Friday’s during the summer months, a general store and transportation services to make your trip a breeze. 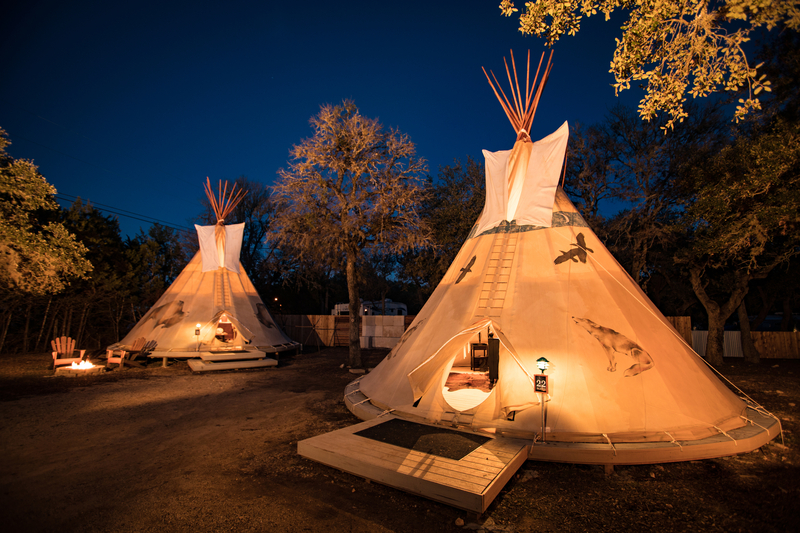 To experience Texas Glamping at Mystic Quarry for yourself, make reservations today!